War of the Realms, the epic comic event coming to Mk1 this April, has been ramping up for months. The dark elf Malekith wages a war that has spread from one otherworldly realm to the next, setting them all ablaze, and now it's time for that war to finally explode into the last realm standing: ours. All the worst monsters from the Ten Realms come pouring in over the globe, and it will take the biggest heroes in the Marvel Universe to stop them from conquering Earth – and the whole realm! 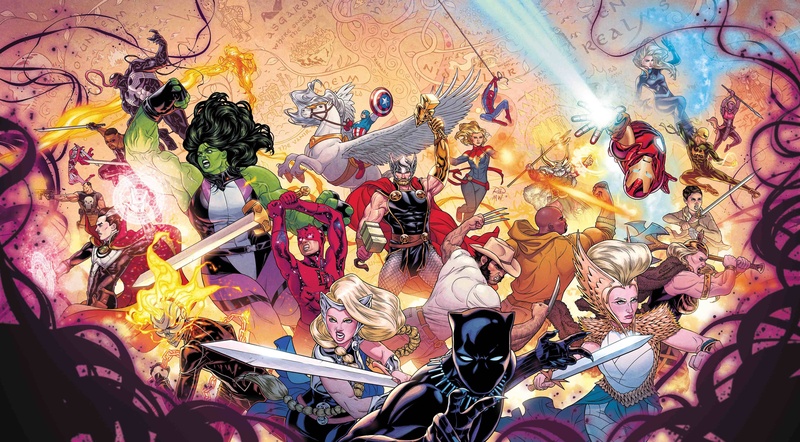 Jason Aaron has been building to this for the last six years in his Thor comic book and the ramifications will have a lasting effect on the Marvel Universe for years to come..
All MK1's available comics, variants, comics, tie ins and War of the Realms miscellany will be housed in this collection. For a limited time each purchase made from this collection will get a free WAR OF REALMS WHEEL OF THE GODS widget (limit one per customer.. while stocks last).